Who doesn’t want a gorgeous summer glow all year around? I guess, maybe, goth kids… but not me! I want that sweet sun-kissed look now, in January. I have tried the Jergen’s brand and it’s great however I don’t love the smell and it leaves my wrists and ankles orange-y. I heard from a friend to try the Target brand sunless tanning lotion for a gradual glow and I went out and bought it. I will keep you updated on the progress and see if this $6 investment is a lucky drugstore steal or an orange Jersey Shore mess. Wish me luck! I have been using this almost daily since I purchased it and I LOVE IT! The smell is fresher than other brands and I noticed a lot less blotching around my knees and ankles. I think it’s wonderful during the winter to give a slight tan and a great addition to a summer glow. I like it because it’s build-able, you can even use it 2 times a day to speed up the process. 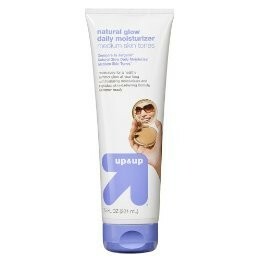 Needless to say, at $6 a bottle Target brand ,Up&Up, sunless tanning lotion is a definite steal.